The true story of "The Mikie Mooneuver"
There is a tradition in military aviation that when a man enters the fraternity of pilots, he is bestowed a call sign (name) by his instructor. In this case, my instructor was Vince Moore and his call sign is "Bluestreak". For better or worse, the student is known by this name forever more to his fellow pilots. 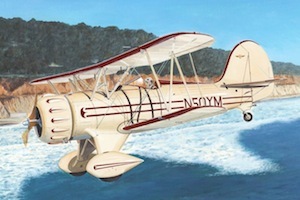 The name is usually a reference to some aspect of the student's early flying experience. My call sign was given in recognition of my discovery/creation of what I have called "The Mikie Mooneuver", which was simple in concept, but could only be achieved under rare circumstances which included the position of the sun and moon at the moment of sunset, in cold and clear weather. Once these conditions are met, the pilot can	create the incredible experience of 3 sunsets, 2 sunrises, 3 moon rises and 2 moon sets all within 30 minutes. I discovered this delightful bit of flying by accident, and on a whim, when I was flying low over the surf, at sunset along the oceanfront between Carlsbad and La Jolla. It was a spectacularly clear day after a winter storm has passed through and there was a chill in the autumn air. I was expecting a "Green Flash" to occur as the conditions were excellent for this rare event, but it was not to be. Sometimes, even though the conditions seem so perfect, it just doesn't happen. I guess we just don't know everything there is to know about the Green Flash. Regardless, it was a fantastic sunset. When the sun finally disappeared from view, it was so awesome a sight that I wanted more, and instinctively pulled back on the control stick of the biplane, knowing intuitively that more altitude would allow me to see the sun again! I had the idea that the sun would actually seem to rise back up out of the ocean as I got higher and higher in my climb. A Mikie-made sunrise on the western horizon! And, obviously, just simply holding my new altitude would allow the sun to sink again, persistently, into the sea. A Mikie-made sunset, effortlessly!!! This was too much fun! I had to do more!! Climbing again, I watched the now expected miracle of the sun rising out of the western sky. Although this time, things happened a bit more slowly. Airplanes climb faster closer to sea level because the air is more dense. Each thousand feet of climb will be slower than the one before. But at last the sun does finally rise again above the ocean, and once there I fly level circles to simply await and celebrate the third sunset. I was feeling pretty smug about my new discovery, but I was totally stunned, on coming around to the east on one of those circles to be confronted with the very top edge of a full moon rising up over the faraway mountains. No one in San Diego could see that moon at that time, only me because of my great altitude, and only I would have known instinctively what to do with it! I continued my circling, now having much more fun, knowing that I was about to watch 3 moonrises and 2 moon sets simply by descending and waiting, just the reverse of the game I played with the sun. I was completely elated with this amazing experience. I talked with many other pilots about this, expecting a reply like: "Oh, sure, I've done twenty in a row. Happens all the time." Only I didn't hear that at all. Most pilots were unaware of such a possibility, and only some, while pleased with the principle at work, had never actually done it. And so, in the fullness of time, and in recognition of this event, I was given the name "Sundance".